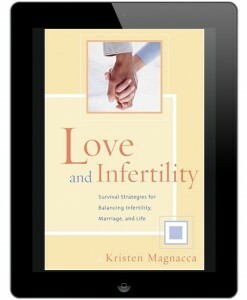 Download the e-book and have all of Kristen’s helpful strategies conveniently located on your phone, IPad or Kindle! Drawn from Kristen’s national speaking seminar “Strategies for Survival – Balancing Infertility, Marriage, and Life,” Love and Infertility focuses on the PP-love&infertilityebookimportance of sharing and communicating so that a couple can move successfully through infertility without the stress of becoming all-encompassing and overwhelming. With honest humor and candid personal accounts, Kristen reveals tips, exercises, and rare bits of wisdom to guide couples through the hardships of infertility. It is more than a memoir; it is a how-to guide as you ride the roller coaster of family creation. Love and Infertility is the inaugural recipient of RESOLVE: The National Infertility Association’s award for Best Book, Coping. Drawn from Kristen’s national speaking seminar “Strategies for Survival – Balancing Infertility, Marriage, and Life,” Love and Infertility focuses on the importance of sharing and communicating so that a couple can move successfully through infertility without the stress of becoming all-encompassing and overwhelming.